There is a yellow line on the center of the body. Each fins are also beautiful yellow. 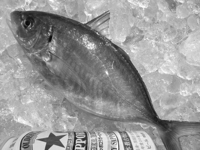 This is a one of the highest evaluation fish in the department of horse mackerel.